At 2:38 UTC Tuesday morning (local time) a Russian Proton-M heavy lift rocket carrying three GLONASS navigation/positioning satellites exploded shortly after lifting off from the pad at Baikonur Cosmodrome. The event was captured on a live Russian news feed, seen above. No word yet on whether there were any injuries or not according to NASASpaceflight.com, no casualties have been reported but the Proton rocket debris may have landed near another pad used by ILS (International Launch Services) — a U.S./Russian joint venture for commercial launches. Reminder: space travel is (still) hard. The shockwave at 1:01… yikes. After an absence of almost two decades, Russia is at last on the cusp of resuming an ambitious agenda of interplanetary science missions on Tuesday Nov. 8 3:16 p.m. EST (Nov. 9, 00:16 a.m. Moscow Time) by taking aim at Mars and scooping up the first ever soil and rocks gathered from the mysterious moon Phobos. Russia’s space program was hampered for many years by funding woes after the breakup of the former Soviet Union and doubts stemming from earlier mission failures. The Russian science ramp up comes just as US space leadership fades significantly due to dire NASA budget cutbacks directed by Washington politicians. Russia’s daring and highly risky Phobos-Grunt soil sampling robot to the battered Martian moon Phobos now sits poised at the launch pad at the Baikonur Cosmodrome in Kazahkstan atop a specially upgraded booster dubbed the “Zenit-2SB” rocket according to Alexey Kuznetsov, Head of the Roscosmos Press Office in an exclusive interveiw with Universe Today. Roscosmos is the Russian Federal Space Agency. Watch the awesome Mars mission animation in my article here. See Zenit Rocket rollout video and images below. “The Phobos-Grunt automatic interplanetary station will launch on November 9, 2011 at 00:26 a.m. Moscow time [Nov. 8, 3:36 p.m. EST],” Kuznetsov confirmed to Universe Today. The Roscosmos video and photos here show the Zenit rocket rollout starting from Building 45 where the final prelaunch processing was conducted late last week mounting the nose cone holding the Phobos-Grunt and companion Yinghuo-1 spacecraft to the upgraded Fregat upper stage. If successful, Phobos Grunt will complete the Earth to Mars round trip voyage in some 34 months and the history making soil samples will plummet through the Earth’s atmosphere in August 2014 to waiting Russian military helicopters. Following an 11 month interplanetary journey, the spaceship will enter Mars orbit and spend several months searching for a suitable landing site on Phobos. The probe is due to touchdown very gently on Phobos surface in Feb. 2013 using radar and precision thrusters accounting for the moon’s extremely weak gravity. After gathering samples with two robotic arms, the soil transferred to the Earth return capsule will take off in the ascent vehicle for the trip back home. “The Zenit can launch spacecraft from Baikonur into LEO, MEO, HEO and elliptical near-Earth orbits (including GTO and geostationary orbit) and to escape trajectories as well,” Kuznetsov explained. The Zenit-2SB booster with Phobos-Grunt and the piggybacked Yinghuo-1 Mars orbiter from China were rolled out horizontally by train on a railed transporter on Nov. 6, raised and erected vertically into launch position at Launch Pad 45 at Baikonur. Likewise the upper stage was upgraded for the historic science flight. “The “Phobos Grunt” automatic interplanetary station mission was constructed by the Russian Academy of Sciences Space Research Institute in Moscow and the spacecraft was manufactured by NPO Lavochkin in Moscow,” Kuznetsov told me. The 12,000 kg Phobos-Grunt automatic interplanetary station is equipped with a powerful 50 kg payload of some 20 science instruments provided by a wide ranging team of international scientists and science institutions from Europe and Asia. Russia’s Phobos-Grunt sample return mission to Mars and Phobos poised atop Zenit rocket at Pad 45 at Baikonur Cosmodrome. Kazakhstan. Liftoff set for November 9, 2011 at 00:26 a.m. Moscow time - Nov. 8, 3:36 p.m. EST. Credit: Roscosmos. NASA’s Curiosity Mars Science Laboratory (MSL) Rover has also arrived at her Florida launch pad awaiting Nov. 25 liftoff. Join me in wishing all the best to Roscosmos and NASA for this duo of fabulous Mars missions in 2011 that will help unravel our place in the Universe – like never before! In less than 48 hours, Russia’s bold Phobos-Grunt mechanized probe will embark on a historic flight to haul humanities first ever soil samples back from the tiny Martian moon Phobos. Liftoff from the Baikonur Cosmodrome remains on target for November 9 (Nov 8 US 3:16 p.m. EDT). For an exquisite view of every step of this first-of-its-kind robot retriever, watch this spectacular action packed animation (below) outlining the entire 3 year round trip voyage. The simulation was produced by Roscosmos, Russia’s Federal Space Agency and the famous IKI Space Research Institute. It’s set to cool music – so don’t’ worry, you don’t need to understand Russian. Another video below shows the arrival and uncrating of the actual Phobos-Grunt spacecraft at Baikonur in October 2011. The highly detailed animation begins with the blastoff of the Zenit booster rocket and swiftly progresses through Earth orbit departure, Phobos-Grunt Mars orbit insertion, deployment of the piggybacked Yinghuo-1 (YH-1) mini satellite from China, Phobos-Grunt scientific reconnaissance of Phobos and search for a safe landing site, radar guided propulsive landing, robotic arm manipulation and soil sample collection and analysis, sample transfer to the Earth return capsule and departure, plummeting through Earth’s atmosphere and Russian helicopter retrieval of the precious cargo carrier. Russia’s Space Agency, Roscosmos, has set November 9 as the launch date for the Phobos-Grunt mission to Mars and its tiny moon Phobos. Roscosmos has officially announced that the audacious mission to retrieve the first ever soil samples from the surface of Phobos will blastoff from the Baikonur Cosmodrome in Kazakhstan atop a Zenit-2SB rocket at 00:16 a.m. Moscow time. Roscosmos said that engineers have finished loading all the propellants into the Phobos-Grunt main propulsion module (cruise stage), Phobos lander and Earth return module at Facility 31 at Baikonur. Phobos-Grunt is Russia’s first mission to Mars in almost two decades and a prelude to an ambitious program of even more interplanetary Russian science flights. Russian Phobos-Grunt spacecraft is set to launch to Mars on November 9, 2011. Technicians also fueled the companion Yinghou-1 mini-satellite, provided by China, that will ride along inside a truss segment between the MDU propulsion module and the Phobos-Grunt lander. 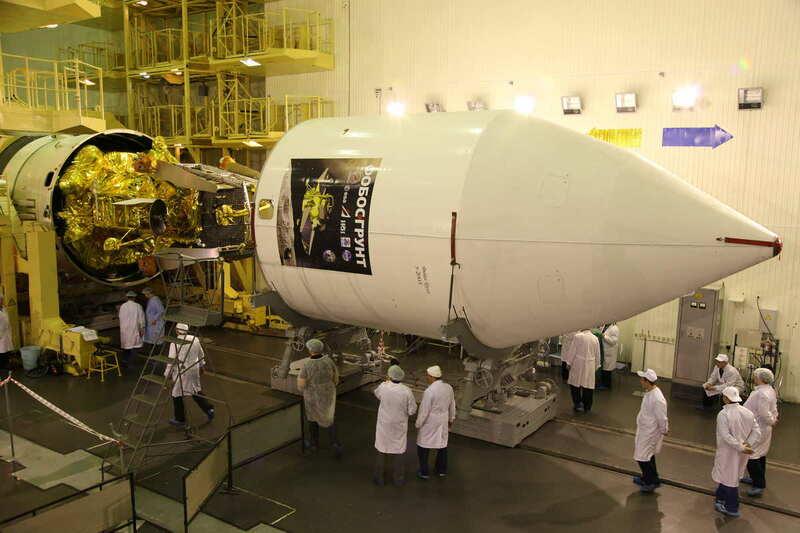 The 12,000 kg Phobos-Grunt interplanetary spacecraft is being moved to an integration and test area at Facility 31 for integration with the departure segments of the Zenit rocket. The next step is to enclose Phobos-Grunt inside the protective payload fairing and transport it to Facility 42 for mating atop the upper stage of the stacked Zenit-2SB booster rocket. After about an 11 month journey, the spaceship will enter Mars orbit and spend several months searching for a suitable landing site on Phobos. The goal of the bold mission is to retrieve up to 200 grams of soil and rock from Phobos and return them to Earth in August 2014. The samples will help unlock the mysteries of the origin and evolution of Phobos, Mars and the Solar System. Scientists hope that bits of Martian soil will be mixed in with Phobos soil. Phobos-Grunt is equipped with a powerful 50 kg payload of some 20 international science instruments. The 110 kg Yinghou-1, which translates as Firefly-1, is China’s first spaceship to voyage to Mars. It will be jettisoned by Phobos-Grunt into a separate orbit about Mars. The probe will photograph the Red planet with two cameras and study it with a magnetometer to explore Mars’ magnetic field and science instruments to explore its upper atmosphere. Watch the video of today’s debut lift off of a Russian Soyuz rocket from the edge of the Amazon jungle at the Guiana Space Center in French Guiana as it successfully carried the first two Galileo In-Orbit Validation satellites to space after an arduous 7 year struggle to mesh Russian and European technologies and cultures – a magnificent achievement that opens a wide realm of new commercial and science exploration possibilities to exploit space for humankind. Launch photos below and here. Now have some real fun and enjoy this absolutely cool Rockin’ Russian music video showing a headless Soyuz rollout to the pad, an erection like you’ve never imagined and capping with the Galileo satellites. Guaranteed you’ve never seen struttin’ like this but will totally get the Soyuz experience in 2 minutes – give it a whirl. They never did it like this in Russia. “This historic first launch of a genuine European system like Galileo was performed by the legendary Russian launcher that was used for Sputnik and Yuri Gagarin, a launcher that will, from now on, lift off from Europe’s Spaceport,” said Jean-Jacques Dordain, Director General of ESA. “These two historical events are also symbols of cooperation: cooperation between ESA and Russia, with a strong essential contribution of France; and cooperation between ESA and the European Union, in a joint initiative with the EU”.